Villa Emiemi has two striking features that make it truly distinct. First, its elevated architecture that necessitates view decks or verandas around every level of the villa. Second, its predominant color scheme that deliberately creates a coordinated contrast of dark and warm elements or hues. Overall, Villa Emiemi has a design that’s contemporary and innovative as well as an ambience that’s stylish and, at the same time, cozy. 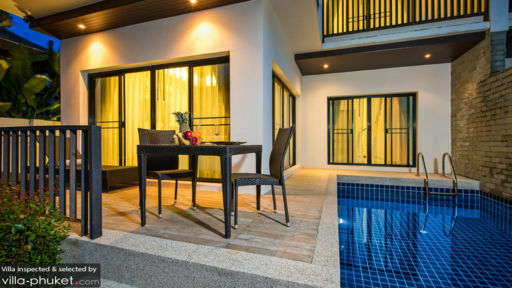 The villa has two bedrooms. Both are on the second floor which open out to verandas overlooking the pool, the garden and the outlying lush surroundings. The focal point of the outdoor area is the six-meter infinity pool. Immersed in its cool and soothing waters you can simply wade or just let yourself float around. On the pool bed up on the covered view deck you can recline and relax. 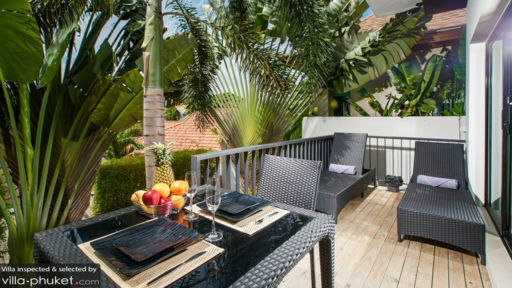 You can also leisurely lounge at the alfresco dining area nearby as you enjoy your favorite drink. Indoors, through floor-to-ceiling sliding glass doors, is the living area with its large and long couch facing a wall-mounted widescreen TV. Here, you can all comfortably settle to catch your must-not-miss TV show. A few steps away is the kitchen section where you can show off your culinary skills as you prepare satisfying meals to be served at the indoor dining area’s table for six. Delineating the kitchen section is a counter which, provided with high chairs, can double as a bar for quick snacks as well as cocktails and after-dinner drinks. A housekeeper, a pool attendant and a gardener make up the staff regularly on duty at the villa. 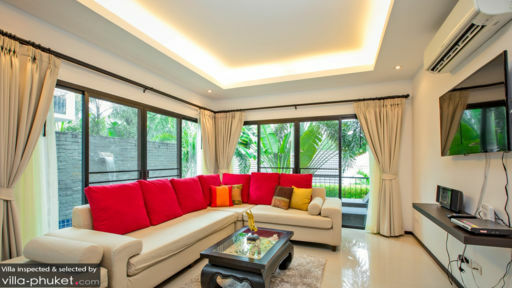 Villa Emiemi is located in the vicinity of Nai Harn – a white-sand beach ideal for swimming. Aboard a traditional Long-Tail Boat, you can set out to sea for an island-hopping tour of nearby Ko Bon, Ko Kaew, Ko Lon, Ko Aeo and Ko Hae – which is also known as Coral Island. While here, you shouldn’t miss out on really delicious seafood especially at Sala Loi where you can also experience traditional dining – from a mat on the floor. Other must-see attractions are the Phuket Shell Museum and Promthep Cape View Point where you can catch spectacular sunsets.